This week saw me arrive in Sri Lanka for the first time. It has been a very busy week travel wise, one of the highlights of which was going whale watching in Mirissa on Sri Lanka’s south coast. Shy and unknown, Mirissa doesn’t even make my map of this magical island, yet somehow it’s a thriving and busy tourist spot, inspired by the world’s largest mammal, the whale. 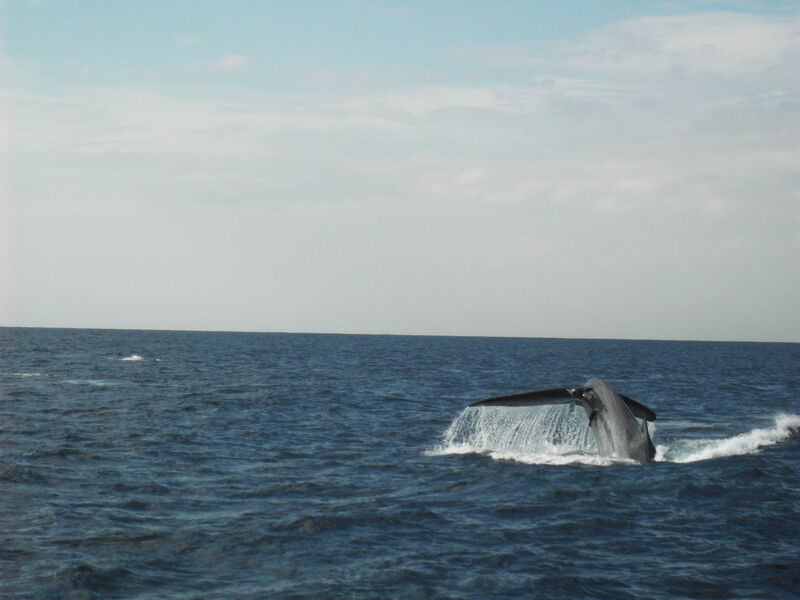 The big attraction in Mirissa in Sri Lanka is whale watching! 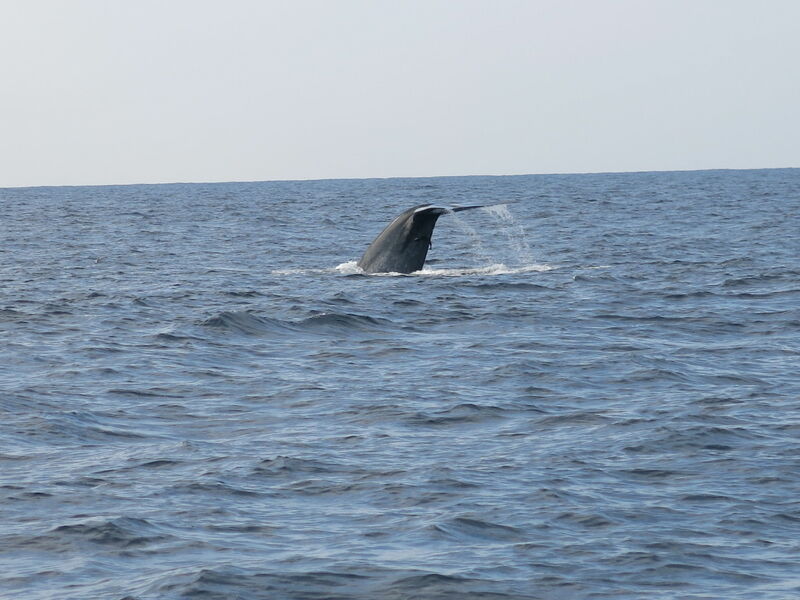 As with a lot of things on your travels, organising the whale watching in Mirissa is incredibly easy. Almost every hotel, hostel or guesthouse in the village offers it. 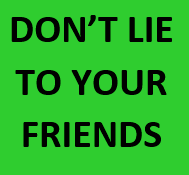 You’ll see signs and adverts for it everywhere. 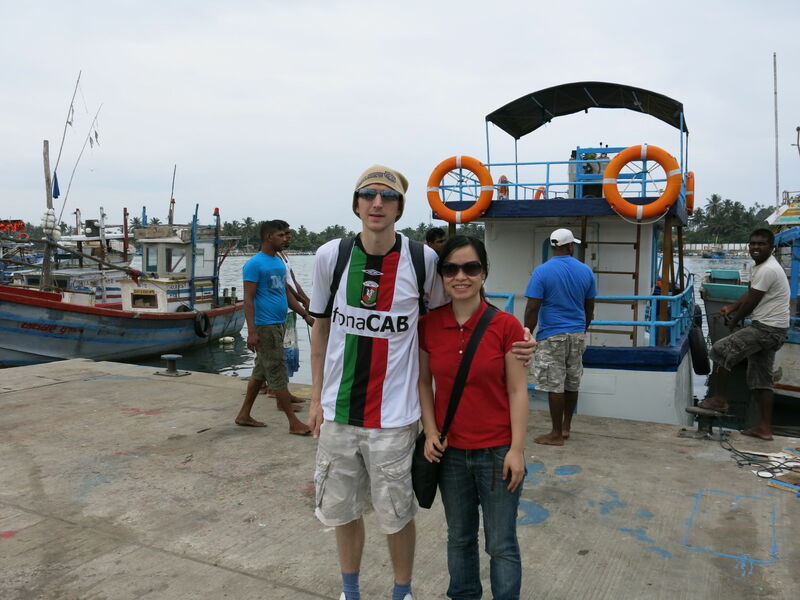 Whale watching in Mirissa – look for the fliers. 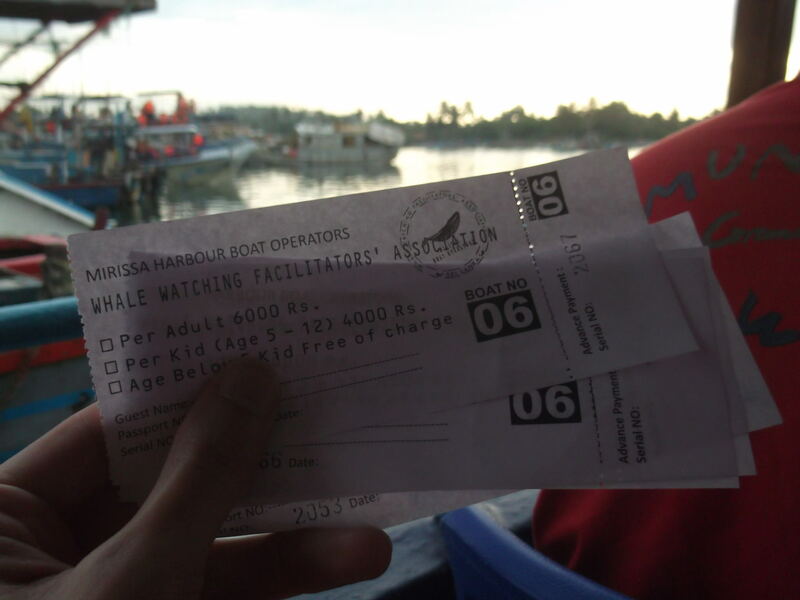 Organising whale watching in Mirissa is easy – get your tickets booked at your hostel/hotel or almost any tourist company in the village. 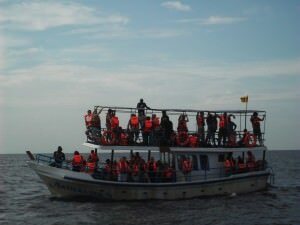 How much does it cost to go whale watching in Mirissa? Unfortunately as Sri Lanka becomes more popular for tourists, whale watching in Mirissa has been getting more expensive recently. There is currently a set rate of 6,000 Rupees per person per whale watching session. This is correct as of February 2013. 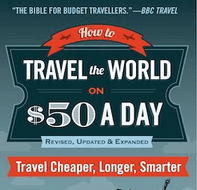 (That by the way is $47 US Dollars – expensive I know but you are almost guaranteed to see whales and have a good time! This is some contrast to December 2012 when the price could be as little as half of that (3,000 Rupees / $24 US Dollars). 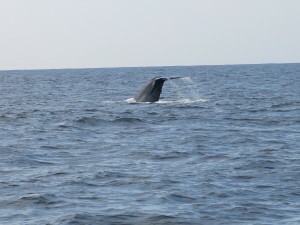 Enjoying the whale watching in Mirissa despite the fact it has gone up in price recently to a set rate of 6,000 Rupees. Popularity and a local capping system have led to this set price of 6,000 Rupees. This includes transport to and from your hotel to the boat for whale watching. It also includes a snack box of breakfast, a bottle of water and a carton of juice. You can try to bargain this price of 6,000 Rupees down, but we tried in 7 or 8 places before we booked and they all now have this standard fixed price of 6,000 Rupees. A packed boat for the whale watching in Mirissa in Sri Lanka! A fun morning! 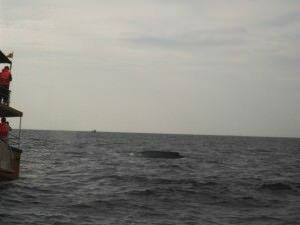 What exactly is whale watching in Mirissa? 6.30 am – Wait at hotel reception for a lift. 6.40 am – Lift from hotel to the ticket collection point for the boat. 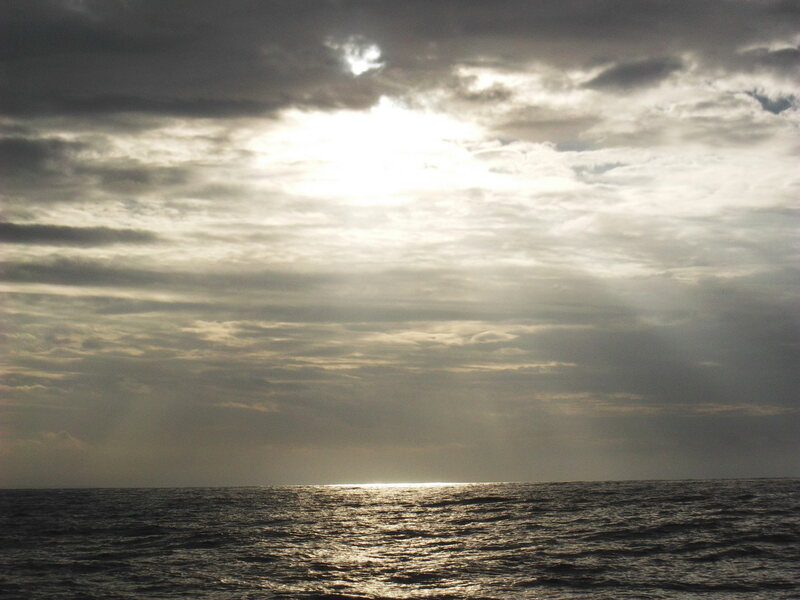 6.55 am – Board the boat and head out to sea, away from the land. 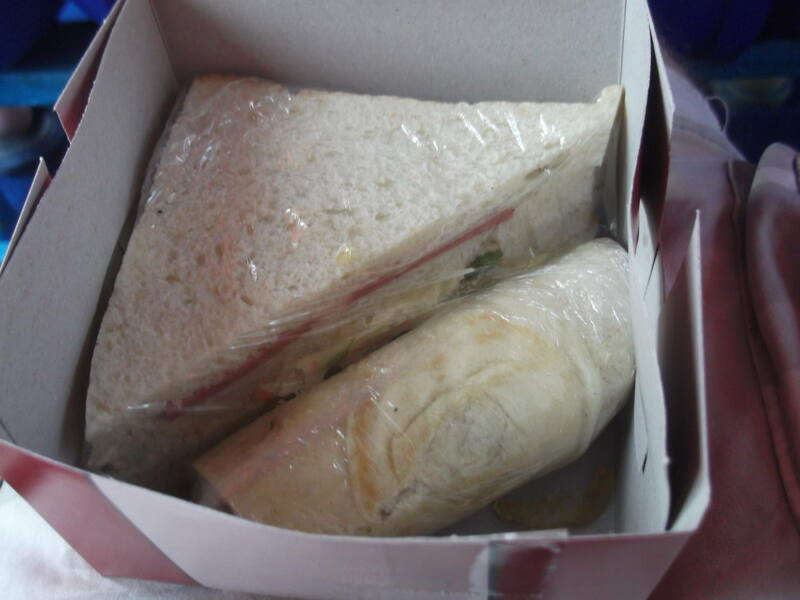 7.12 am – Breakfast is served, with a snack box contaning a sweet cake, a sandwich (cheese, salad and salami) and a wrap (salami and coleslaw) plus a bottle of water. We are in the Indian Ocean and far out. Breakfast when you’re whale watching. Does the job – water and a juice are also included. 8.20 am – Far out to sea we get our first sighting of whales. About 6 of them are gathered and there are two other whale watching boats beside us. For the next hour or so we see a decent number of whales, some very close to the ship. The main features are the whales jumping up out of the water with their tail in the air and the whales squirting water up in the air. It’s not a cartoon myth – whales really do that! 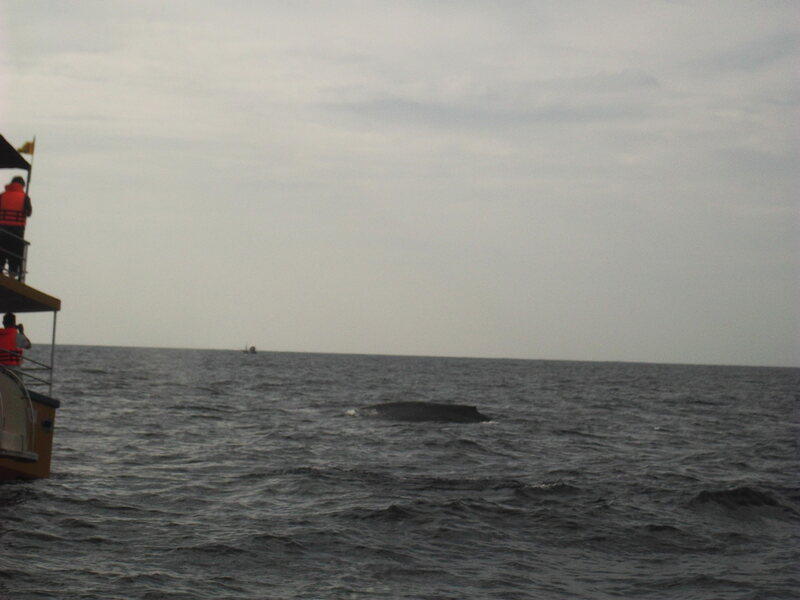 Have your camera at the ready for the whale watching in Mirissa as you get pretty close! 9.35 am – We start to head back to the coast and we are each handed a carton of mango juice. 10 am – On the way back we see dolphins too, on both sides of the boat. 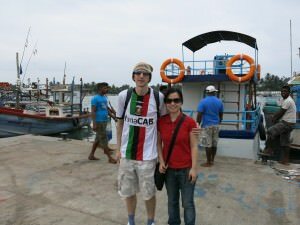 10.45 am – We arrive back at the harbour and get a three wheeler (tuk tuk) back to our hotel. 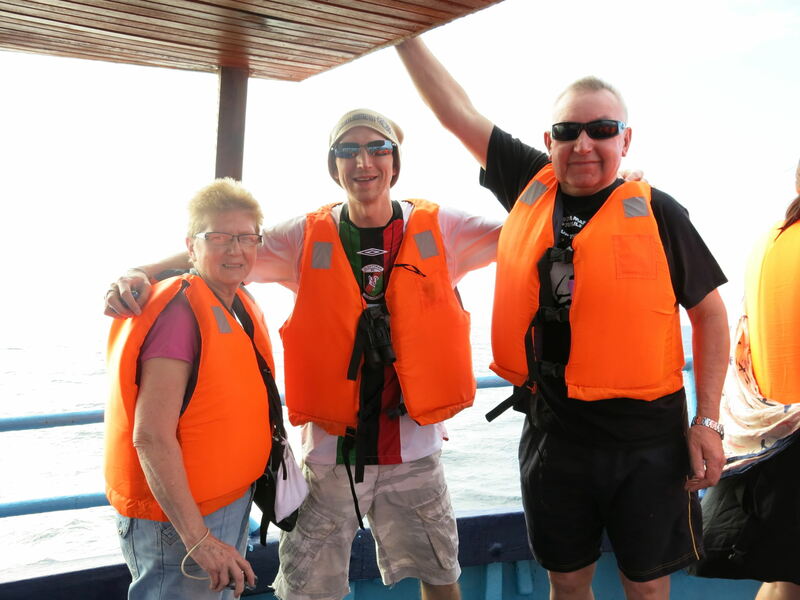 Whale watching in Mirissa was extra special for me as my Mum and Dad joined me for it! Amazing! This was also a special travel experience for me as my parents joined me on it as they are touring Sri Lanka with me! They loved it. I only see them once a year at the moment and it’s incredible to have my Mum and Dad on the other side of the world with me. Where to stay in Marissa? Marissa relies on tourism so there are countless places to stay. That said, it gets busy in the holiday season so I advise you to book in advance if you know the exact days you are staying. 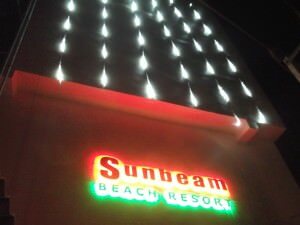 We arrived in Marissa around 6pm and found that a lot of places were fully booked, we ended up staying at Sun Beam Resort which is new and beside the beach. Sun Beam Beach Resort in Mirissa – there are a host of accommodation options in Mirissa. – Take plenty of water with you (even though they give you one). 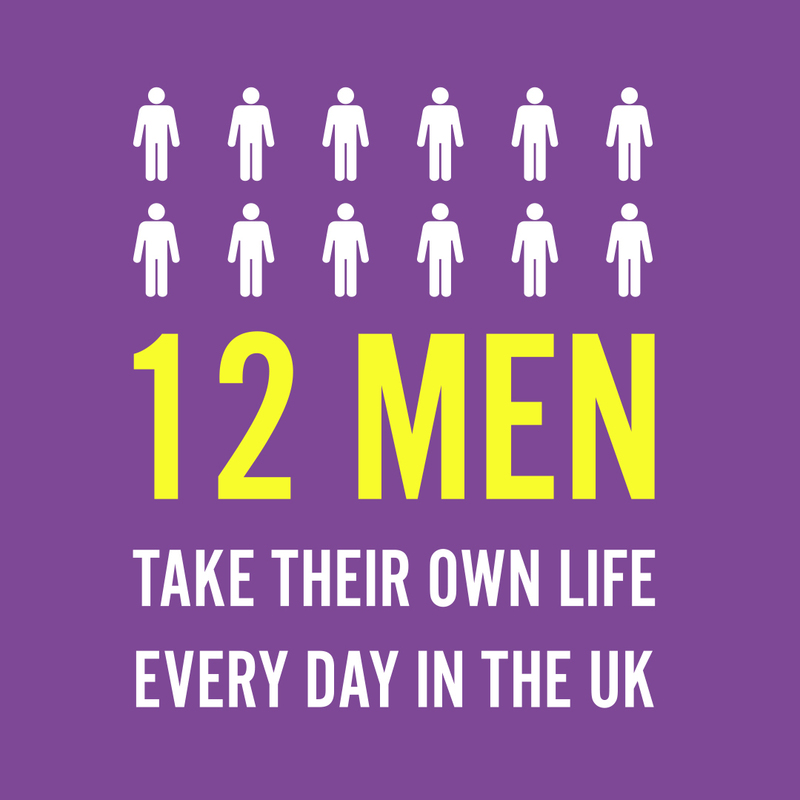 – If you do suffer from sea sickness, take some tablets beforehand and bring them with you. – Don’t drink alcohol the night before and get a decent night’s sleep and you’ll be fine. – Charge your camera and bring spare batteries. – Bring a coat or jacket as it gets a bit cold out at sea. – Bring sunglasses, a hat and sun cream! Sunrise at Mirissa from the boat on the way to the whale watching! There will be a lot more to come from Sri Lanka believe me! On a bit of a whirlwind tour, keeping up with my tagline a lifestyle of travel! 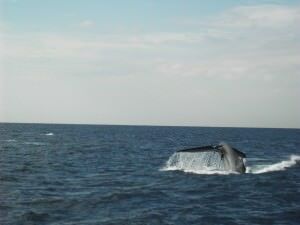 This entry was posted in Animals, Asia, Mirissa, Sri Lanka, Whales. Bookmark the permalink. ← Friday’s Featured Food: New Zealand Fergburger! 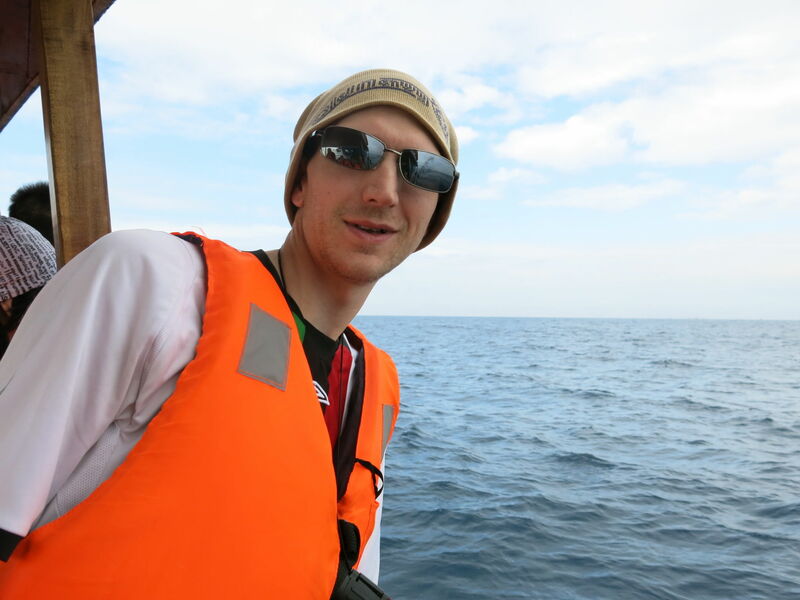 Great article Jonny – Must say I’m very jealous; I went to Iceland last year and went on a whale watching tour – Supposedly an 85% success rate for sightings and guess what…. I was one of the unlucky 15%!!! I bet it was fantastic to see them up close like that, especially with your parents.